Last week I had the chance to grab lunch one day in Ybor with a friend at the Laughing Cat, an Italian restaurant on the corner of 8th Ave. and 15th St. (several doors down from the old Tampa Bay Brewing Company location). While I had never been to the Laughing Cat before, this friend was a fan and I'd also read that it offered a lunch buffet that was worth checking out. According to Laughing Cat co-owner Franco LoRe, the name of his restaurant comes from the name of the cafe in Venice, Italy ("Il Gatto Cheride" in Italian) where he met girls as a younger man. The Laughing Cat is tucked into a relatively small corner space, but feels comfortable inside. We arrived towards the end of the lunch crowd for the day and both decided upon the lunch buffet. It seemed hard to go wrong at nine bucks per person; everyone else seemed to be doing the buffet too. The buffet isn't large, but offers several hot and cold Italian dishes, ranging from ravioli and pasta dishes, both in a vodka sauce, to mozzarella caprese (I'm a sucker for big fresh chunks of mozzarella) and a delicious salad filled with plump shrimp. The only mildly disappointing dish was meatballs in a red sauce that was almost gone when we got there. Again, this wasn't a big buffet, but it was certainly of a higher quality than I expected and a real deal at nine bucks each. The lunch buffet is only available during the work week. Service was fine last week for lunch, but I don't know what the little place is like at night on the weekends when it gets busy. I'm also curious what ordering off the menu is like. 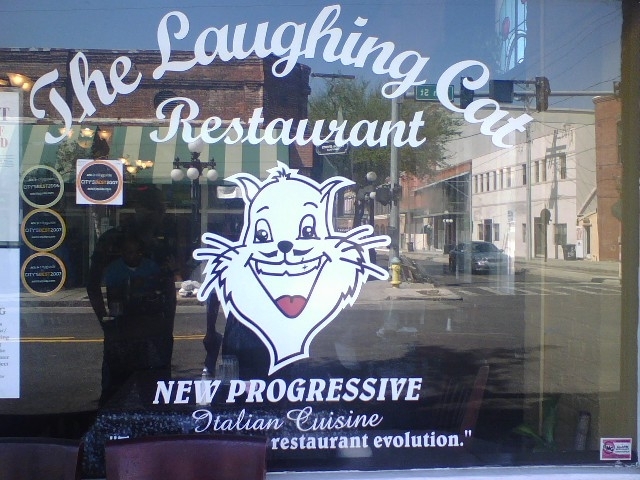 I plan to add Laughing Cat to our rotation of Ybor restaurants that we like, which includes the original location of The Columbia, sandwich shop La Tropicana and the at-times-maligned Big City Tavern. I've previously panned for the most part my experiences with Samurai Blue and La Creperia. I haven't tried Carmine's, Acropolis or Bernini. I'll try to get off this new buffet mini-kick. 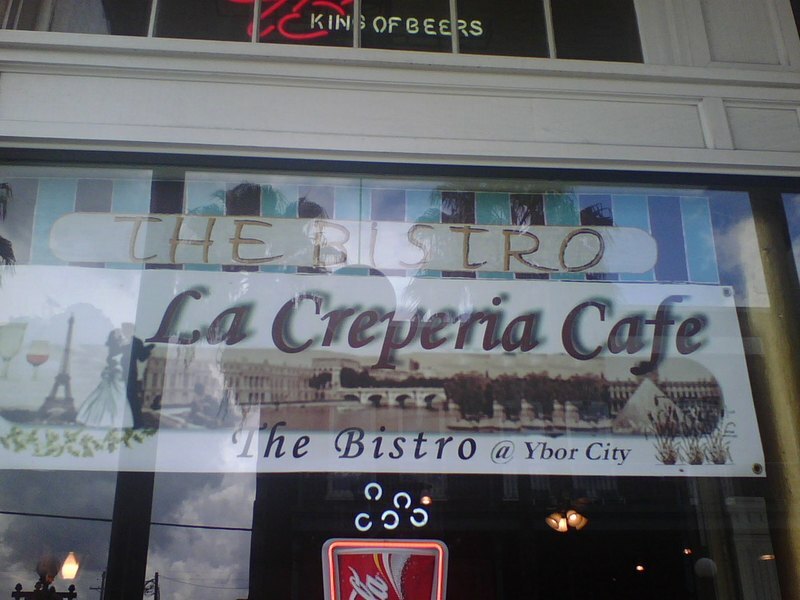 So what's your favorite Ybor restaurant? Bottom-line: If you happen to be in Ybor for lunch during the work week, and you're in the mood for homemade Italian cuisine, the Laughing Cat's lunch buffet is worth giving a try. Inspection Scorecard: Last Inspection: January 2007 violations - Critical (8), Non-Critical (2). On Sunday we decided to stop in to La Creperia, a relatively new French bistro on 7th Ave. in Ybor City that specializes in crepes. The restaurant is located between the old Italian Club and La Terrazza. We had eaten at La Creperia two times before (on the first visit we sat up at the bar and met the extremely nice owner). On our last visit with a large group some months ago the service had been wholly underwhelming. I'm all for giving places second chances, though, especially a unique and potentially tasty concept like La Creperia. However, after our experience last Sunday I'm sorry that I did. Service was again a mess and the food was just average. In addition to traditional desert crepes, La Creperia offers a huge selection of crepes as entrees stuffed with almost anything you can imagine. I ordered an Oppa Mexicana crepe (the server plainly told me she had "no idea" what items on the menu were spicy, umm ok) and a Caesar salad while Traci ordered a Prego (roast turkey) crepe. The Caesar was overloaded with dressing, used iceberg lettuce (no romaine), and had a few lonely croutons. My crepe was okay, but no flavors stood out and it was overwhelmed by the sour cream and salsa on top. I had a bite of Traci's crepe and thought it was okay, but she pointed out that a different cheese was used than what was on the menu. We would have ordered a desert crepe, but after the slow and clueless service, my patience was shot. A couple at a table near us looked equally frustrated. Bottom-line: La Creperia may have a unique concept, but the execution has been muddled on my last two visits. I wouldn't go back for more than a final try at a dessert crepe (the Romeo Y Julieta - nutella, banana and strawberries - was tasty). Inspection Scorecard: Last Inspection: October 2005 violations - Critical (3), Non-Critical (0). Yesterday for lunch we went the La Tropicana, which has quickly become our favorite lunch spot in Ybor City. 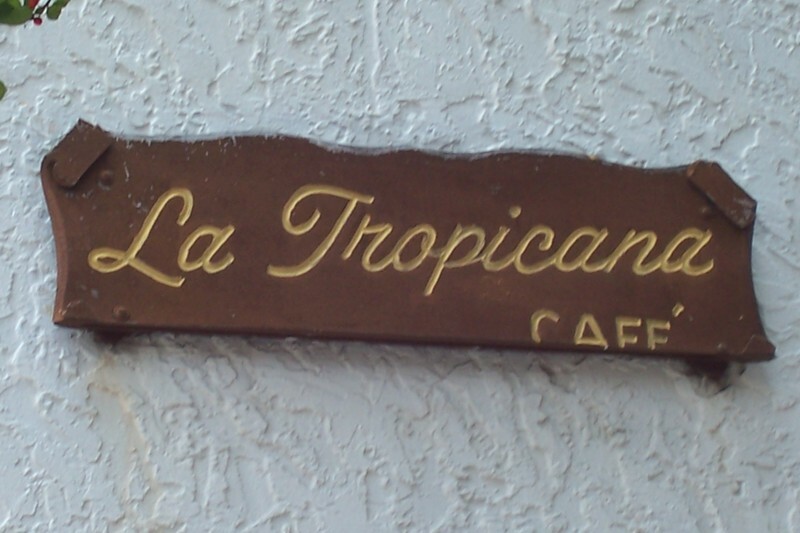 While The Columbia restaurant is top of mind for most folks when it comes to good food in Ybor, and I've eaten at various Columbia locations many times before, La Tropicana is tops in my book for authentic Cuban food in Ybor. Compared to The Columbia, La Tropicana is the new kid on the block. The Columbia dates back to 1905, La Tropicana since 1963. I ordered "the special" which is half of a Cuban sandwich (a good sized portion) and a bowl of black bean soup. I tried to order a chicken salad, which they were out of so I was forced to have a Cuban instead. Traci had a greek salad. Every meal comes with warm Cuban bread with butter. La Tropicana's Cuban bread is out of this world and reminds me of New Orleans french bread. We sat up at the counter which puts you more in the mix of the hustle and bustle of the wait staff. Service is quick, prices are great (cash only, though, this is old school and family run) and the food is consistently top notch and authentic as it comes. A great no-frills lunch spot. A fun factoid is that President Bush stopped by La Tropicana for lunch when he was in town a few years ago. La Tropicana proudly displays a picture of the visit up at their register. Bottom-line: Great Cuban food at extremely affordable prices in a historic setting. No visit to Ybor during the day is complete without grabbing a bite to eat at La Tropicana.